In working with hundreds of clients, I have been developing a repeatable process that allows you to stay in that state of flow, have fun, and create repeatable results in all your sales conversations. Using a tool I call a roadmap. I am going to break it down for you and share an overview video I just created for the Academy. Before we dive into the roadmap, I am pumped to share with you a soft launch of the new online platform we created. I do sales training, consulting, and coaching all over the world where I build programs and tools for my clients. An awesome online community to bounce ideas off of! Anyways, had to share that…check out the Sales Hero Academy here. Bonus: For the next 10 people that sign up, I will give you a 50% off coupon code…ROADMAP50 – even crazier deal! Okay, So Why a Roadmap? The main reason for this is that sales conversations, and talking to people for that matter, is usually unpredictable. Using scripts is helpful, but we often find ourselves being overly robotic or not allowing a conversation to be natural…like two humans talking. Also, based on the principle of habits, we design the system to allow us to decrease our mental energy by building the right cue-routine-reward process. It allows us to be more present and authentic, while following a repeatable series of steps. Additionally, we incorporate a number of feedback loops into the process so we can constantly adapt and learn as we go along. This way, we don’t become too rigid. 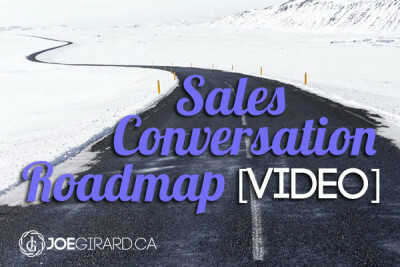 By using a sales conversation roadmap, it’s kinda like one of those “Choose Your Own Adventure” books I read as a kid! Probably one of the areas we spend lots of time on with clients is in preparation. We work extensively on customer segmenting, building powerful questions, and ensuring we have the right mindset before we go into any call. We leverage the power of the RAS or “Reticular Activating System” which is essentially that part of our brain that can hear our name being said even in the noisiest of rooms. It is a survival mechanism that we can use to our advantage during a sales conversation. When we do the preparation, we set our brain up to pay attention without us having to expend too much energy. Think about how Bob Sledders visualize, for example. What do want to know about them? What do I want them to know/think/feel? What might they say or ask? Now, you can simplify this process by making general assumptions about your segments and then filling in the blanks during the call, but try this pre-call planning process and see how it gets you mentally prepared next time. Setting the tone for your conversation is a big advantage. How quickly can you be authentic, disrupt their patterns, and connect with them? The stronger you open, the more likely you will begin in control and be able to maintain it. One easy way is to use the words “You” and “Because” together when you start. Do you see how you can connect quite quickly? This is where we build our YOU/BECAUSE tools to make sure we open strong. And we test the crap outta them! What happens after we open? Well, that’s the fun part…anything can happen! This is where the bulk of the conversation will happen. Write down all of the types of conversations you typically have with clients. It could be about them just doing research, changes they are making, excitement, etc. Your goal through this process is to understand the change for your customer from current reality to future reality – their goals – and challenges to get to those goals. It’s natural to want to jump right to the offer or bounce from topic to topic, but when you get good at deepening a dialogue to fully understand, you win. 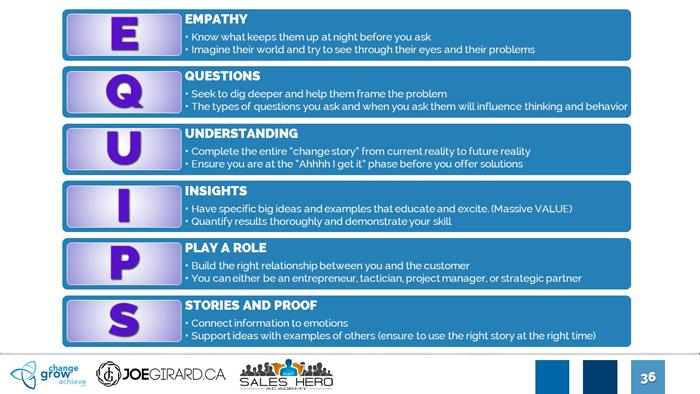 By beginning with empathy and asking great questions, you will help your customer better FRAME their challenges, rather than rushing to solve. What I often see people do in a sales conversation is ask a bunch of questions, then jump into a pitch. When you do this, you actually engage that survival mechanism in the brain to be on guard. Instead of this clear separation, you should try to oscillate between questions, insights, and stories – all while getting more clarity on the need for change. That way, when it comes time to present your offer, you are in the best position possible with the right language. Plus, the amount of time spent pitching drops to very little, if any at all! Wouldn’t it be great to just say, “It sounds like you would be a great fit as a client, so here’s what we should do now!” and they are totally ready to buy? Make sure that before you move to the offer that you are all in agreement about the story. You want to paraphrase, ask for clarification, and ultimately get them to agree on a need. Not that they need YOU, but that they need to do something and that they see the full impact of their challenges. And the test for that is that you shouldn’t move forward until you have the thought, “Ahhhh, I get it!” in your head. You should be ultra clear that the new way forward makes sense. The reframe is an excellent way to ensure you haven’t missed anything and don’t open yourself up to premature objections. Remember that often when you get an objection you are already too late, so don’t rush the sales call. It’s much harder to save a lost call than to have reduced resistance in the first place. If you have done the previous steps correctly, your offer presentation should not have to be very long and, in fact, it should just be a logical progression. If you find that you spend quite a bit of time on presenting your offer, I would suggest you step back and see why. Most likely, it’s because you didn’t establish the right conversation. Now, the trick in presenting is that you want the customer to feel like you are selecting the offer specifically for them – as in you have a product in mind that completely fits everything you have discussed. This is why it’s important to have multiple, tiered offers available to you. You should have a primary one that you want them to accept, an upsell you can offer (a premium package) that you can prime them for a longer-term relationship, and a downsell just in case they may not be totally qualified. This way, you can present the offer without feeling like you have to sell. You want your conversation here to feel like a collaboration on a solution and get them to participate in the actual offer discussion. Think about mirror neurons for a second. Essentially your mood, energy, and intention can impact those around you. And there is a very big difference between asking for commitment with a question mark or an exclamation mark. It is all about confidence. If you are confident that your customer should move forward, that you are genuinely helping them, and that you are legitimately excited for them, that will shine through in the way you get someone to take action. If you are hesitant or lack confidence, your customer will naturally feel the same way and be less likely to take action. Be excited about them taking action and get them pumped up about next steps. Remember that you are the one who is the expert, and if you see the way forward, tell them what they need to do to make it happen. You’ll be surprised at how well this works and that most people will just go along with it. If they say yes, great – do the next thing! Ask for a favor or concession. Leverage the power of reciprocity here. There are two times when you want to ask for a favor. First, when someone says thank you, and second, when someone says no. There is a golden window when someone doesn’t accept your first offer, to then introduce a secondary commitment request. You see, when I listen to sales calls, sometimes people don’t even ask for commitment once, let alone two or three times. Adding multiple requests will dramatically increase your conversions! In our programs, we help our clients design these commitment requests so that they always have some smaller step their clients/customers can take, even if it is reading a whitepaper, watching a video, or doing a demo. Get them to do something. And lastly, if they give you a stall or objection, now is the right time for it – not earlier in the conversation. So do work on what your most common objections will be and bring them back to the conversation stage. Want Help With Your Roadmap? Now, we have covered a lot of info here, but I hope this helps you see that you CAN create solid, repeatable conversations that you can control and be less “salesy” with – all without having to be overly scripted! If you want to build this for your own business or your teams, reach out to me here. We will work together and build this specifically for you, including the tools, language, emails, scripts, and processes so you can go get those customers ASAP. If you want to do the on-demand, awesome modules for yourself, you will want to check out the Sales Hero Academy where we have been loading our best training, expert interviews, and all the tools you need. And at a crazy price! BONUS CODES: I have also created some limited time bonus codes for those who take action quickly – first come, first served! And if you want to join the Facebook Group to see what everyone is talking about, click here. Lots of awesome discussion on sales, sharing ideas, and people to connect with! Remember to like and share this post! Comment on how you master our own conversations!